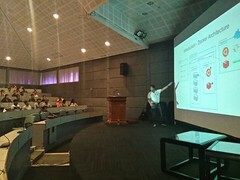 Today I delivered a Docker 101 session at Trivandrum for Prathidhwani. Prathidhwani is Socio Cultural Organisation for Technopark Employees Employees. 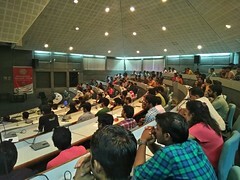 In Jan’s Docker meetup Shahinshah reached out to me do a session in Trivandrum. He connected me to Bibin who followed up with me after that. After few discussions we decided to do it on 4th March. As it was community event, I did not charge anything. I think it as our responsibility make people know about new technologies. How they can save time, money and at the same time upgrade the skill-set to keep them relevant. I reached Trivandrum at 9:40 AM and went directly to the venue. More than 300 people registered and ~15o people showed up, which is really good. We started the session on time 11 AM and finished on time at 3:30 PM. Most of participants were new to Docker and containers in general. The audience was interactive and asked good questions. I enjoyed giving my session there. I hope they also learned something new. During the session I also asked few questions to participants and gave away few subscriptions of my Containers Fundamentals course. After the session Bibin, Shahinshah and I went to Kovalam beach. I took the 10 PM flight and came back to Bangalore. Overall it was very good trip. Thanks Prathidhwani for inviting and organising such event.